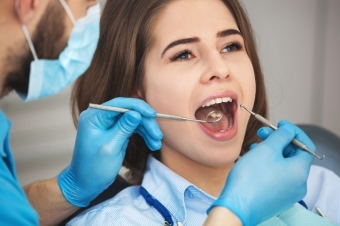 There is a variety of treatment options for gum disease (surgical, non-surgical and medicinal), and the one that’s right for you will depend on the stage of your gum disease. Gum disease treatments range from non-surgical therapies and medicines that control bacterial growth, to surgery to restore supportive oral tissues. To help you control the growth of bacteria in your mouth, your periodontist may advise you on how to improve your at-home oral hygiene routine, including improving your brushing and flossing technique, adding supplemental elements like mouthwash, and eating a more oral health-friendly diet. During professional dental cleanings, a dentist or hygienist will remove any plaque or tartar build-up on your teeth. Plaque and tartar are what ultimately cause gum disease. Tartar can only be removed with professional cleaning, so it’s important to schedule these regularly, ideally twice a year or as prescribed by your dentist. Scaling & Root Planing is a non-surgical deep cleaning, performed under local anesthetic, in cases where there is plaque and tartar below the gum line. During this procedure, plaque and tartar both above and below the gum line are scraped away (scaling) and the rough spots on the teeth are smoothed down (root planing) to provide the gums with a clean surface to re-attach to the teeth. This procedure is performed if your gums have lifted away from the teeth to develop periodontal pockets. These pockets are an ideal place for oral bacteria to thrive undisturbed, because they can’t be reached by normal brushing or professional dental cleaning. This allows tartar to develop under the gums. During a pocket reduction procedure, the gums are lifted and the tartar beneath them is removed. Any irregular surfaces of the damaged bone are smoothed, and the gums are positioned so that the tissue fits snugly around the teeth, to limit areas where disease-causing bacteria can grow. This procedure is done to replace any portions of jaw bone that have been destroyed by gum disease. During the procedure, fragments of your own bone, synthetic bone or donated bone are grafted to your healthy jaw bone material. This procedure reinforces thin areas of gum and fills in any areas of gum that have been destroyed by gum disease. During the procedure, grafted tissue (most likely taken from the top of your mouth, is stitched into place adding tissue to the affected area). This procedure is typically done in combination with flap surgery, in cases where the bone tissue that supports the teeth has been destroyed by gum disease. During the procedure, a small piece of mesh-like fabric is inserted between the bone and gum tissue, to prevent the gum tissue from growing into the area where the bone should be, so that the bone and connective tissue can regrow to better support the teeth. This procedure smooths out shallow craters in the bone that exist due to moderate or advanced bone loss, making it harder for bacteria to grow. Antibiotics: Used in combination with other therapies or alone to reduce or temporarily eliminate the bacteria associated with gum disease. Chlorhexidine: An anti-microbial used to control plaque and gingivitis, or periodontal pockets. Fluoride & Antibiotic Toothpaste: Used to reduce plaque and gingivitis. If you have questions about the form your gum disease treatment may take, please feel free to contact our Lethbridge Periodontal office any time!